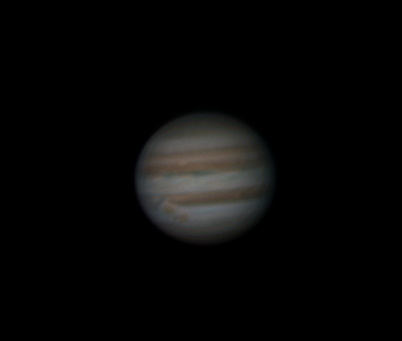 A DFK21 camera was placed at the prime focus of an 8", f/10 SCT and a 3 min AVI was captured at 30fps. The image contains Jupiter, Ganymede and Io. Ganymede appears to be closer to Jupiter's disk in the image. The Great Red Spot and the Oval BA, a structure that formed in 2000 from the merging of 3 white ovals, are both visible.